CBM’s programme to train people with disabilities in organic farming in India has been shortlisted for an award recognizing innovative ways of improving access to employment and work for people with disabilities. The programme will be showcased this week at the Zero Project Conference in Vienna, an event to share innovative and effective solutions to problems that people with disabilities face, helping to create a world without barriers. With support from donors in the UK, CBM's programme brings together over 11,000 farmers, with and without disabilities, and provides them with training and jobs in organic farming. Organic methods are considerably cheaper than conventional farming methods as they do not require expensive chemicals. Farmers are also supported to set up inclusive self-help groups (SHGs), where they contribute part of their monthly income to a general pool, creating a fund from which members can borrow as needed, such as for supporting their healthcare, education, and housing. Maya, 36, is a single mother of four children who benefitted from the programme. She uses a customised wheelchair tricycle to get around, as she has been unable to stand or walk independently because of paralysis caused by childhood polio. “Like most people with disabilities, I faced derogatory comments and exclusion from social life,” she recalls growing up in a community that had many people with disabilities but with little awareness about rights of people with disabilities. When her husband died, she was left supporting 4 children. 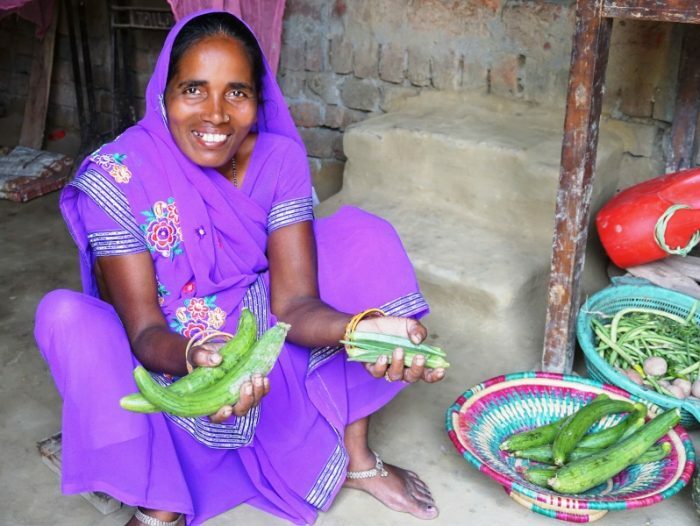 Thanks to a group loan and her own savings, Maya now has a shop to sell her produce and is confident about the future. “I am happy with the way things are turning out. More and more women with disabilities are getting inspired by what we are doing here. This success is important to change the negative mindset community has about persons with disabilities”.